Would you like some quick tips for using the Coastal Atlas Map? In the Puget Sound area, all shoreline development is regulated. That means if you want to build a house or driveway on your waterfront property, erect a staircase to the beach, or install a bulkhead, you need a permit from your local jurisdiction—either the municipality or the county. Each local jurisdiction has its own regulations on waterfront development. You may also need a Hydraulic Project Approval from the Washington Department of Fish and Wildlife, and potentially a federal permit. 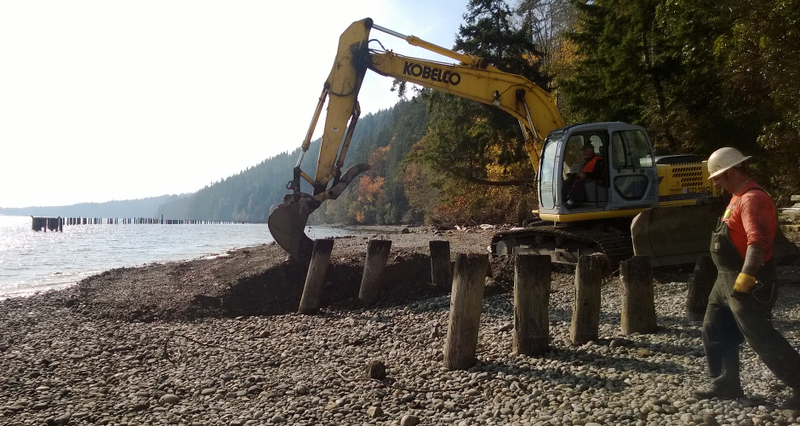 You need a permit to remove a bulkhead or make other substantial changes to your shoreline. For example, if you want to install, repair, or replace a bulkhead, you need a permit from the municipality or county, the state, and in many cases the U.S. Army Corps of Engineers. In some local jurisdictions, you need a permit to install soft shore protection or remove large trees and overhanging vegetation on the shore. Fortunately, our state offers a combined permit application called the Joint Aquatic Resources Permit Application (JARPA) that covers most approvals at the local, state, and federal levels. Resources to help you navigate the permitting process are available through the Office of Regulatory Innovation and Assistance. The Project Questionnaire will help you find out what permits, licenses, or approvals you may need for your project, and you can also connect with a staff member in person. The Northwest Straits Foundation and county-based programs offer resources to help with permitting. You may be eligible to receive assistance with your permit and even get free permit-ready designs for your property. New bulkhead construction is rarely approved unless erosion threatens a home and softer alternatives are not feasible. This project has been funded wholly or in part by the United States Environmental Protection Agency under assistance agreement PC 00J29801 to Washington Department of Fish and Wildlife. The contents of this document do not necessarily reflect the views and policies of the Environmental Protection Agency, nor does mention of trade names or commercial products constitute endorsement or recommendation for use.